In a 2-quart saucepan over high heat, bring wine and shallots to a boil. Reduce heat to medium-high and reduce sauce to 1/8 c, about 8-10 minutes. Add cream, reduce for 6 minutes. Fold in butter until melted. Add dill, lemon juice and capers. Set aside and keep warm. Heat oil in a medium sauté pan over medium high heat. 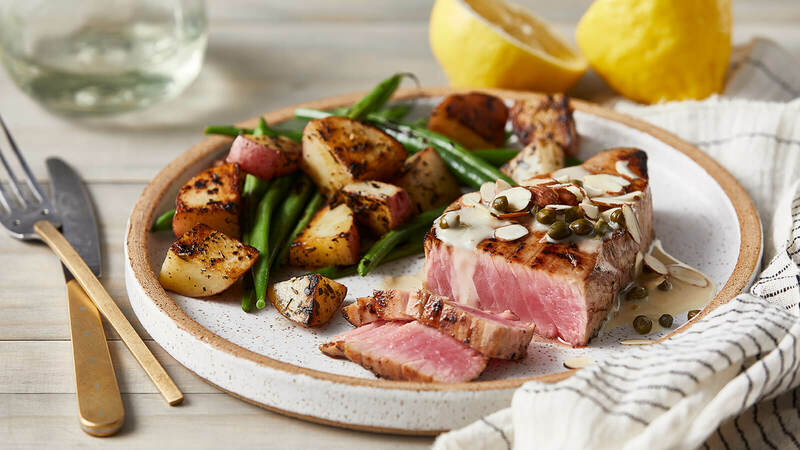 Sear tuna steaks until golden, about 3-4 minutes per side. To serve, drizzle tuna with sauce and garnish with almonds.